At roughly 6-foot-5, Andrew McMillan never looked like a typical patient at Valley Children’s Hospital. But at that height and age 17, Andrew was diagnosed with acute lymphoblastic leukemia – one of the most common forms of childhood cancer. And he was eligible for treatment at Valley Children’s, the leading provider of comprehensive inpatient and outpatient pediatric cancer and blood diseases services in Central California. Today, Andrew is healthy and nearing the end of a trip to China. The California State University, Fresno, student spent close to a year at Peking University – known as the “Harvard of China” – to advance his study of the Chinese language. 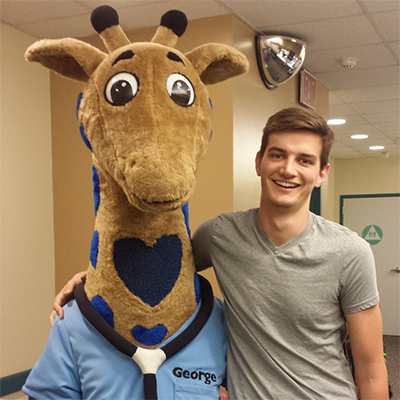 Andrew, now 22, credits Valley Children’s with helping him regain his health and continue life’s adventures. Dr. John Gates, a pediatric hematologist/oncologist at Valley Children’s, called Andrew “inspiring” in refusing to let cancer derail his dreams. Thanks to the medical team and the Valley Children’s Childhood Cancer Survivorship Program, Andrew also had the tools and information he needed to live safely in China. Dr. Gates, director of the survivorship program, said Andrew is similar to many patients who move or head to college beyond Valley Children’s geographic range. The survivorship program – one of few in California – has helped prepare him and others for the future by providing education, health screening, documented treatment histories and more. The program is critical because today most children survive cancer. An estimated 375,000 adult survivors of childhood cancer are living in the United States; roughly two-thirds will experience long-term side effects due to effective yet toxic treatments. Andrew, who left for China last summer, felt well-prepared for the journey. He had access to healthcare there and even sent a routine blood test report to Valley Children’s from a Chinese hospital last October. The staff “enjoyed seeing the Chinese characters for blood counts alongside the English abbreviations,” Andrew said. The trip would have been impractical a few years ago. In January 2011, the lanky teenager seemed to tire easily. He struggled to finish chores like shoveling snow at the family’s Big Creek home in the Fresno County foothills. When Andrew told his parents, Laura and Andrew, that he felt “winded taking a shower,” the family headed to the doctor. From there, it was straight to a local emergency room and a pivotal choice: Valley Children’s or a hospital that treats adult patients. It was an easy decision. Valley Children’s has long offered access to the best and most current treatments through an association with Children’s Oncology Group, the world’s largest organization dedicated to childhood and adolescent cancer research. Nationally, the pediatric hospital is among the leaders in enrolling patients in the group’s therapeutic studies. Andrew was diagnosed with acute lymphoblastic leukemia, a cancer that develops from cells in bone marrow. When lymphocytes – or white blood cells that fight infection – grow abnormally and multiply, those defective cells quickly crowd out and block production of healthy cells. While Andrew might have been treated at a general hospital, Dr. Gates said pediatric hospitals often are more familiar with the various forms of childhood and young adult leukemia. Effective therapies for older adolescents and young adults have more in common with those used for younger children, he said. Most react well to treatment. “For a child who has a good response to therapy and a low-risk profile, the cure can be more than 90 percent,” Dr. Gates said. Andrew was immediately treated with high doses of chemotherapy – drugs used to kill cancer cells. He often spent four days at a time at Valley Children’s Hospital and dealt with feelings of isolation along with heavy side effects like nausea. At first, Andrew was anxious. Friends and family provided welcome support, and he also began to lean on the Hospital staff. That camaraderie extended to the whole McMillan family – including Andrew’s younger sister, Heather, who was barely a teenager when he was diagnosed. She remembers that doctors took time to explain the disease and treatments. The McMillans spent many long days at the Hospital. Heather became known as “the piano girl” because she sometimes practiced in the lobby. After about six months, Andrew’s treatments became less intense and his Hospital visits were less frequent. He was allowed to venture out more in public but often wore a mask over his nose and mouth to protect against germs. He completed treatment in 2014. Andrew, who was homeschooled, postponed college following his diagnosis. When he began preparing applications for a second time, Valley Children’s social workers, nurses and others pointed out scholarship prospects. In fall 2012, Andrew enrolled at Fresno State partly to remain close to the Hospital. 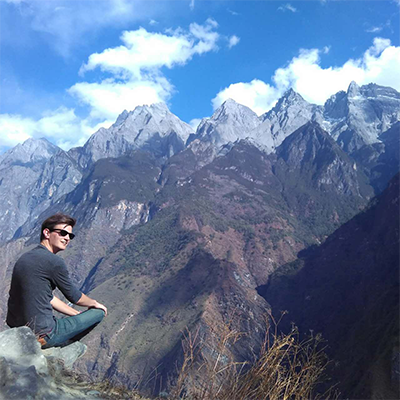 He spent the most recent academic year in China through a Boren Scholarship, which finances language-related studies in certain countries in exchange for a year of federal service. Andrew returns to Fresno later this summer and will complete his senior year at Fresno State, where he is majoring in business administration with a minor in Chinese. He’ll live on campus and work as a resident adviser in the dorms. After graduation, he’ll look for a job in marketing, technology or international trade. Andrew’s mother said she is grateful for the role that Valley Children’s has played in his life.